Across the United States the HVAC industry is expected to grow significantly between now and 2024. That makes this an excellent time to enter a profession in the industry, and one of the highest paid and employable positions in air conditioning, heating, and refrigeration (or HVAC) is as a technician. According to the United States Bureau of Labor Statistics, the need for HVAC technicians is expected to rise by 14% in the next six years.. Interested in joining this exciting profession in San Antonio? An HVAC technician is responsible for the installation, maintenance, repairs, and replacement of heating, air conditioning, and refrigeration systems. It is a tactile position that is fantastic fit for people who like to work with their hands and solve problems. As the job requires knowledge of wiring, piping, power tools, and HVAC systems, to become a technician requires certain education and training. Certain skills of a HVAC technician are learned while on the job, but the knowledge and certification required to obtain that first position comes from the education and training offered by colleges, technical schools, and other institutions in San Antonio. •	Remington College: This technical school provides HVAC training in accordance with national standards for information and education in the industry. The HVAC program at Remington College is a diploma program, which means students graduate with diploma, not an associates degree, in the field. In Texas this is sufficient to obtain entry-level positions. There are 11 core courses offered in Remington College’s HVAC diploma program. These courses cover both residential and commercial HVAC, and focus on practical and hands on training. The program also prepares students to become certified by the EPA for specialized work in refrigeration and other HVAC industries. •	Fortis: Fortis Institute has locations and programs across the United States. Their closest campus to San Antonio, offering HVAC training and education is in nearby Houston. The focus of the technical institute’s HVAC program is on the basic information and training required for entry-level positions in Texas. 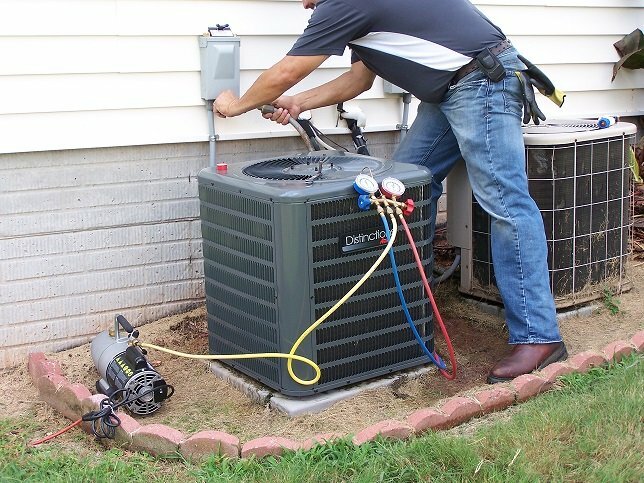 It offers coursework on installation, maintenance, and computerized diagnostics, which prepare a HVAC technician for employment in either residential or commercial work. •	Lamson Institute: This is a local career school in the San Antonio area that offers training in several skilled trade and technical industries, including for medical assistants, optical assistants, electrical technician, and HVAC technician. The program has components for residential and commercial HVAC technicians, and provides practical experience for private employment and in hospitals, hotels, and manufacturers. •	Southern Careers Institute: The Southern Careers Institute is a technical institute that provides education and training in multiple industries. Their San Antonio campus offers a program in HVAC, as part of their skilled trades department. Upon completion of the course, students are prepared to take a number of examination or certifications at the state and national level, including HVAC Certification, EPA Certification, and Green Certification. While many of the education and training programs are focused on real-world and practical experience, these institutions often offer the necessary certifications and licensing that will land a HVAC technician a job in San Antonio. To work in the field, a HVAC certification is required, but there are additional certifications available. These more specialized certifications include EPA Certification, Green Certification, R410A Certification, Indoor Air Quality Certification, and Preventative Maintenance Certification. These specializations allow an HVAC to work in environmentally focused positions within the HVAC industry and other in-demand positions. HVAC associations in San Antonio are also helpful for securing employment or advancing a career. The Texas Air Conditioning Contractors Association is a statewide association that accepts all skilled and licensed HVAC technicians who are currently working in the field of owners of businesses that employ HVAC technicians. There are local, statewide, and nationwide HVAC associations and industry groups located in San Antonio, Texas. These organizations offer support, networking, continued education, and other services to HVAC technicians and others in the industry. The Texas Air Conditioning Contractors Association is a statewide association with a chapter in San Antonio, TX. The local chapter is extremely active in the industry and provides events and associate training to the Greater San Antonio area. Also, the association provides consistent updates to rules and regulations affecting the HVAC industry in Texas. The Plumbing Heating and Cooling Association also has a local chapter in San Antonio. This is a national, professional trade association that is narrowly focused on individuals and businesses in the HVAC industry. There are good opportunities for entry-level HVAC technicians in San Antonio, Texas. A number of large employers and small businesses look to add trained and licensed HVAC techs to their teams. Examples of current openings include positions at Ontime Elmer, Hidalgo Industrial Services, ConServ Building Services, and Schmidt Mechanical Group. The largest residential HVAC employer in San Antonio is Jon Wayne Service Company. In addition to these companies that hire HVAC technicians directly, a number of staffing agencies in San Antonio look to place technicians in the HVAC industry. A benefit of working as a HVAC technician is the possibility of specialization in a specific area of the industry. There is no additional training required to become specialized, but experience is a must. The highest paying positions for HVAC technicians in San Antonio are in commercial HVAC, technical services, and electrical troubleshooting. However, a number of technicians in the city also work in residential positions for a good salary. The average salary for HVAC technicians in San Antonio, Texas is an hourly rate of $19.58, which is well above the minimum wage in the state. Other reports state that the average annual salary as $55,603. This average salary takes into account both entry-level and experienced technicians, but is still 8% below the national average for HVAC technicians in all of the United States. Of course, entry-level positions pay noticeably less than jobs for experienced and skilled technicians. The HVAC industry leaders in San Antonio have provided substantial support and relief efforts to those affected by Hurricane Harvey. Through associations and led by the largest employers in the area, HVAC technicians in San Antonio have provided services and emergency work throughout southern Texas. It is another example of the commitment to community and outreach efforts by the HVAC industry in the area. There is also new acquisition news for HVAC technicians in San Antonio. National leader Service Experts acquired one of the larger residential HVAC employers in the area, Aramendia Plumbing, Heating & Air. The deal will expand the services provided by the company and introduces plumbing as part of the core business model.